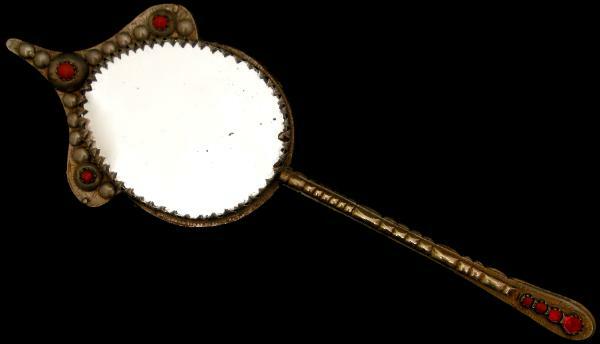 This elegant hand mirror is decorated with a fabulous gilt metal backing inset with engraved tear drop coral cabochons, silver and gilt applique, and foiled faceted glass. Applied to the centre of this elaborate backplate is a tiered boss in green enamel, topped with a round, engraved coral. The use of enamel in this type of Ottoman filigree work is relatively rare. The handle of the mirror is of hollow cast gilded silver decorated to both sides with red foiled glass and coral cabochons. The form of the backing is similar to an Ottoman belt buckle and might have been fashioned from a buckle or been made by a buckle maker.